Tiny in size, but generous in style, this corner vanity sink adds the finishing touch to your bathroom, dressing area, or powder room. 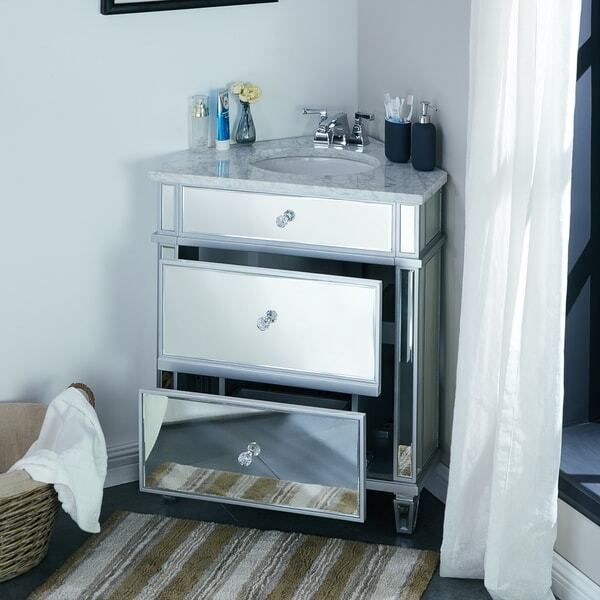 Soft gray marble graces the top of this vanity for long lasting beauty. Treat your bathroom to a luxurious marble upgrade with this mirrored bathroom vanity cabinet. Mirrored siding reflects the surrounding area, opening up small bathroom spaces. Assembly: Required; 2 person assembly. Professional installation of plumbing equipment is recommended. Dimensions 23.5 In. X 29.0 In. X 34.0 In. Beautiful overall and generally well packaged on arrival. Arrives in 2 separate LARGE packages-- one for sink quartz? top and the other for the wood and mirrored bits. Initially thought overstock send the wrong vanity because none of the parts I unpacked were mirrored!! Turned out the mirrored bits were put away safely in extra packaging elsewhere. Whew! The reasons I take off a couple stars are: 1. Lack of storage space: From the outside the vanity appears very spacious- but be warned. It has VERY little storage space. The top drawer is a dummy. Makes sense- there's a sink behind it. But- the 2 drawers below could easily have been spacious! They're only 1/2 of what they really should be. Pretty lame. Also- the vanity literally has no back to it. 2. Shoddy workmanship: So, I started off this review by saying that overall it's very pretty. And that's still true... from afar. On close inspection... yikes. The painting of the silver non-mirrored parts is drippy and too thick and sometimes is even all over the mirror... yet in other places it's too thin and there are obvious cracks and the wood underneath is visible. Whaaaaaaaaa.....?? So yeah. Pretty piece from afar. Needs more storage. Needs actual professional detail work. Will definitely NOT be passing this down to my grandkids, to put it lightly. Very disappointing, given the price. "Can I get some customer satisfaction feedback on this item?" Santa Fe Ceramic Art Allegheny Bathroom Vessel Vanity Sink - 15-3/4" O.D. X 5-3/4" D.